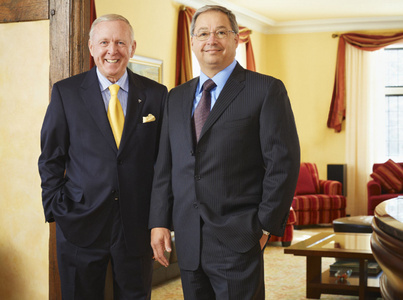 After donating $10 million to the University of Toronto Mississauga in May 2010, Carlo Fidani issued a public challenge. The Mississauga businessman called for others to step forward and match his gift to help build a new health sciences complex on the U of T’s Mississauga campus. Terrence Donnelly, a retired lawyer and philanthropist, met the challenge – then trumped it by adding on an additional $2 million. On Thursday, the university will announce Donnelly’s $12 million donation, the largest ever made to its Mississauga campus. Fidani, who previously held the honour for his May donation, has no qualms with handing it over to Donnelly. The new health sciences complex – now formally known as the Terrence Donnelly Health Sciences Complex – will house the Mississauga Academy of Medicine. U of T’s faculty of medicine, Trillium Health Centre and Credit Valley Hospital are partners in the academy. Starting in September, 54 undergraduate medical students will be trained at the academy every year. The first class will graduate in 2015. The combined gift of $22 million will help construct the four-storey complex and will support students through bursaries and scholarships. Fidani, whose family has a history of funding health care initiatives, said the looming doctor shortage prompted him to donate to health care education. Donnelly, who funnels his philanthropic gifts to health care and medical research, also felt compelled to help educate new generations of physicians. The complex, scheduled to open in August, will also be home to the graduate biomedical communications program and research laboratories. Donnelly is proud of the new four-storey building that will now bear his name. Catharine Whiteside, dean of the university’s faculty of medicine, said Fidani and Donnelly’s co-investment will help ensure more doctors live and work in the Mississauga community. “They are role models for philanthropy at the University of Toronto and for our hospitals,” she said.